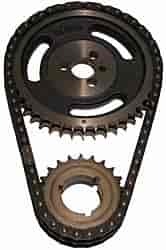 Cloyes Timing Components TRUE ROLLER CHEV " ROCKET"
Cloyes True Roller Timing Chains reduce friction and wear with full-roller action on 0.250" solid rollers and carburized pins, resulting in less chain stretch and up to a 10 HP gain. Durability is also optimized by using high-quality, heat-treated billet steel sprockets with three keyways for more precise adjustments. Does Cloyes 9-3146 fit your vehicle?